Before the iPhone “officially” hit the China market, there was already a booming iPhone market taking well underway. The iPhone black market in China has always been booming, practically from day one the iPhone debut. 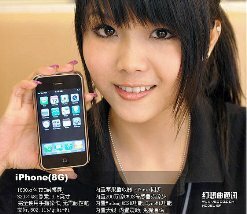 The problem has been, however, that the Chinese government refused entry of the iPhone into the China market place. No problem with that decision however, because the iPhone black market in China has been exploding. Apparently there are a lot of people in China that are wanting to live ethically when it comes to doing business. And because of that conviction, the benefactor has clearly been Apple (NASDAQ:AAPL). As was reported in Apple’s earnings yesterday, 8.752 million iPhones Apple sold in Q2 2010 beat Wall Street’s estimates by 25% to 30% — or nearly 2 million phones. Did China meet your expectations?